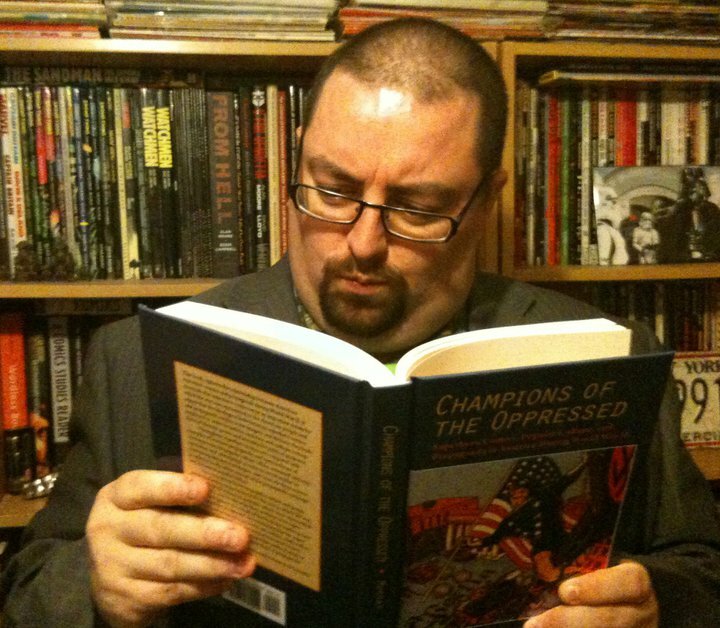 Dr Chris Murray is a lecturer and programme convenor in English for Dundee University's School of Humanities with research interests in comics, film and popular culture. He has contributed articles to the academic International Journal of Comic Art, Gothic Studies, and several books on comics, and has written a book on comics and propaganda. 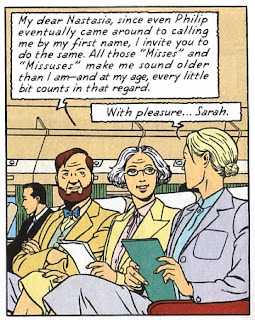 He is also editor of the peer-reviewed comics journal, Studies in Comics. 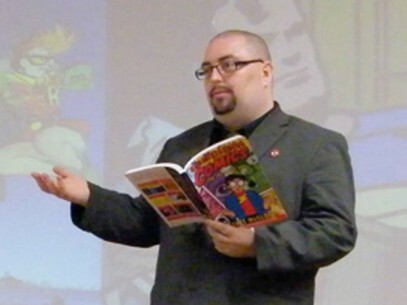 Chris organises and runs the Dundee Comics Day event, now part of the Literary Dundee festival, that since 2007 has grown out of a purely academic conference to become a day of talks and presentations from comics professionals plus an associated art exhibition. Beginning with the 2011/2012 academic year, he will be running the post-graduate Master of Literature (MLitt) in Comics Studies at Dundee that was derided by MP Tom Harris, the Labour MP for Glasgow South, when it was announced. Jeremy Briggs talked to Chris about the reaction to the MLitt announcement as well as his plans for this year's Dundee Comics Day. downthetubes: Much was said in June about the new MLitt in Comics Studies course at Dundee. Could you tell us what the course is about and the academic requirements needed to take part? Chris Murray: The course aims to provide a space for the academic appreciation of comics at postgraduate level. I already teach some undergraduate courses on comics, so it seemed time for the next step. There is certainly a gap in the market for this kind of course, and a demand for it. 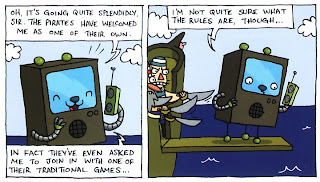 The course, contrary to the views expressed by Tom Harris, has a wide remit, with one module on autobiographical and documentary comics, another comparing various international comics traditions, and a third which is for those with an interest in creating comics. All students also write a dissertation on an aspect of comics history. The normal entry requirements are the same for any MLitt course in the Humanities (a 2.1 degree), but as it isn’t very likely that anyone will have an undergraduate degree in Comics Studies there has to be some flexibility in terms of the discipline. Some of the students who have been applying have a degree in a Humanities subject, such as English, Film Studies or History, whereas others have Art degrees. One of the applicants who inquired about entry next year has a degree in Astro-Physics but wants to study comics! The appeal of the course has been quite wide, but the course isn’t just an opportunity to pursue a hobby in a University setting. Many of the students currently on the course want to pursue comics academically, others want to be creators, or work in the creative industries, whereas others are using it as a means of professional development (yes – we have someone who currently works in the comics industry taking the course!). DTT: MP Tom Harris’ tweets, which rather showed his ignorance about the MLitt, caused a flurry of indignation amongst the British comics community that was picked up on by some of the Scottish press. What was it like to be at the centre of a mini storm? Chris: I take things like that in my stride these days. I knew there would be some backlash, and there’s been things like that in the media before (Biff! Bam! Crikey! Comics in Universities, eggheads read comics, blah, blah, blah…) but having taught comics and researched comics for several years I don’t feel like I have to prove anything to Tom Harris. I’m part of a growing community of comics scholars, and I can tell you there is some incredible work being done by these highly talented and driven people. 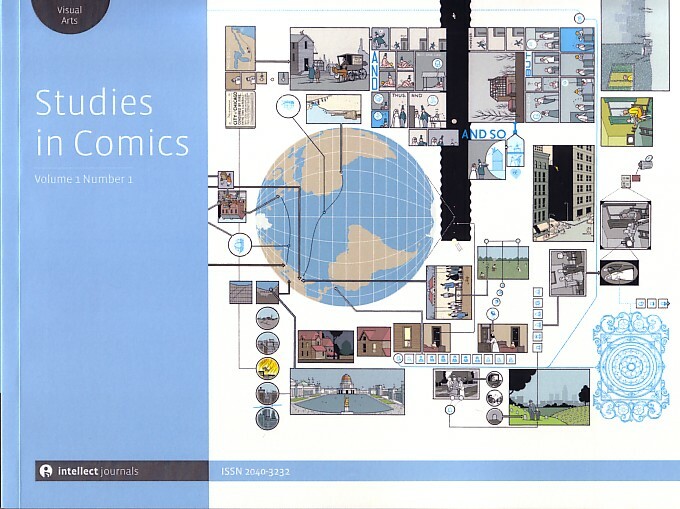 Comics Studies is here. We aren’t waiting for the approval for everyone with an opinion and access to a Twitter account. My abiding memory of that incident was the huge amount of support that came my way, not least from downthetubes, but also from David Lloyd and lots of other people I’d never met who just wrote to me out of the blue to express their support. The University, and Dundee politicians, were also very supportive. In the end, so much flak was flying in Harris’ direction from so many people that I just stood back and let them set him straight. The most surprising thing was that a politician would believe what was written in a tabloid. Hook, line and sinker. He made his comments based on a tabloid story and didn’t even check his facts. You’d think a politician would be a bit more savvy. Then again, it’s been mentioned to me that certain politicians use Twitter to drop little controversial nuggets out there to generate a bit of hype and to create an image for themselves. Far be it from me to suggest that this was the case here. 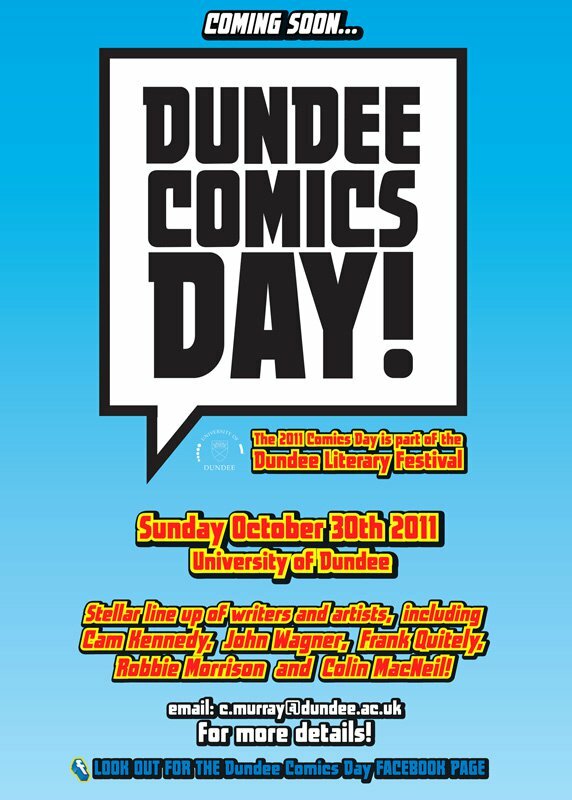 DTT: In my review of the 2010 Dundee Comics Day, which included talks from Pat Mills, Alan Davis and Dez Skinn, I described it as "the highlight of my comics year so far". How do you plan to top last year's programme? 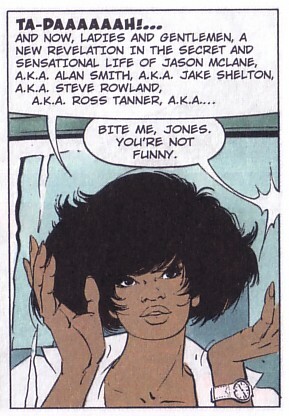 Chris: Luckily for us the UK is home to an astounding array of comics talent. This year we have John Wagner, Frank Quietly, Cam Kennedy, Robbie Morrison and Colin MacNeil, which I’m sure you’ll agree is a pretty amazing line up. DTT: Over the years the exhibitions tying in with the Comics Day and its spin-offs have included original artwork borrowed from the DC Thomson archive, from early pages of the Dandy, Beano and Magic right up to covers and internal artwork from Starblazer on display. 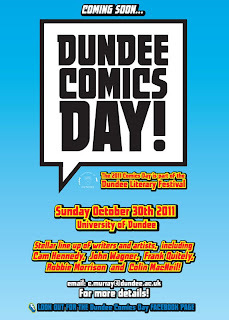 Is there an associated exhibition with this year's Comics Day? Chris: Yes, we have a display of artwork from Commando, which is celebrating its 50th Anniversary. The exhibition, curated by Matthew Jarron (Museum Services, University of Dundee), just went up. It looks great. I love the Ian Kennedy stuff in particular. It was a real treat to go to the Commando offices to pick out the artwork for the exhibition and speak to the editor Calum Laird, who provided us with some great material and some cracking anecdotes!. DTT: Could you tell us a little about the Studies In Comics journal and how it differs from a commercial comics magazine such as Comics Heroes or a comics fanzine like Crikey? Chris: Studies in Comics, which I co-edit with my partner-in-crime, Dr Julia Round (University of Bournemouth), is a peer-reviewed academic journal. It comes out twice a year from Intellect. 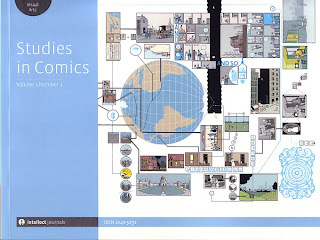 The journal exists to provide a forum for academic work on comics, although that can be from any perspective. The thing that distinguishes an academic journal from a commercial magazine or a fanzine is that academic work is usually designed to address the subject matter from a theoretical position, or to advance a methodology for criticism and analysis. I enjoy Comics Heroes, and they’ve had some great articles and interview. Likewise, I thought that (the much-missed) Crikey! had some very well-researched articles on comics history. However, they are not intended to work in the same way as an academic journal. They are different tools for different jobs, although I think that the co-existence of commercial magazines, fanzines and academic journals is great and they all enrich one another. 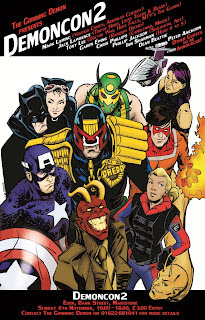 DTT: Your book Champions of the Oppressed: Superhero Comics, Propaganda and Popular Culture in America During World War Two was recently published by Northampton Press in the USA. Can you tell us a little about it and how your interest in the subject began? Chris: I’ve always been interested in comics. My earliest memories are of looking at comics and being fascinated by them. This never went away, despite the fact that I also became very interested in literature, especially William Blake, Thomas Hardy, T.S. Eliot, and so on. I also loved film and art. When I was at University I studied literature (after very nearly going to art college). I always felt that there was an undeniable connection between literature, art, film and comics. When I came to study literature academically I found that any theory or critical position that could be adopted to study literature could be applied just as readily to comics, and the connections between comics and the other mediums were obvious. What was fascinating though were the differences, what comics could do differently, or better. When I discovered that I could write my undergraduate dissertation on anything I wanted, as long as I could get a tutor to approve it, I lined up my arguments and knocked on Dr Keith Williams’ door. He worked on modernism, media and science fiction, so I though there was a good chance he’d hear me out. As things went, he was more than happy to discuss the project, and to supervise it. He later supervised my PhD. I have a lot to thank Keith for. He was always encouraging, yet challenged me always to be rigorous and thorough. 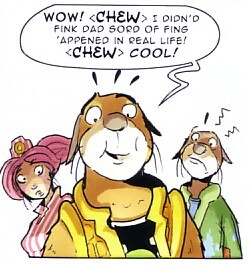 Likewise Roger Sabin and Paul Gravett, who’ve always been incredibly supportive. When you have people you respect standing behind you, and colleagues like Julia Round, Billy Grove, and Phil Vaughan, standing beside you, some ill-informed rants on Twitter don’t really add up to much. The book grew out of the PhD and allowed me to explore the political messages communicated by comics during the Second World War. I argue that comics were able to go a lot further than many other mediums, notably film, in presenting propaganda messages, as they were less regulated by government. It was a fascinating topic to research and gave me a new insight into the power of the superhero as an icon, and as a metaphor for ideological positions. My current research is on British comic writers and artists, and I’m very much enjoying working on this. As I said earlier, the UK is home to incredible talent. 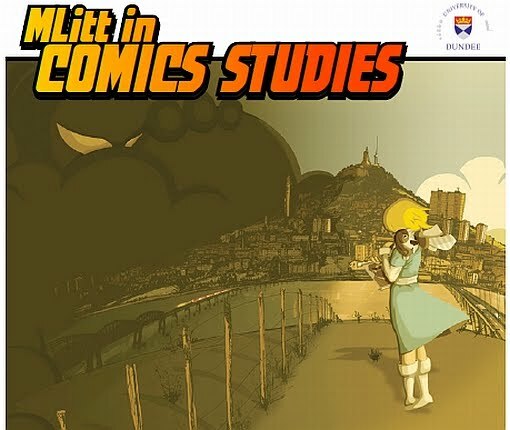 It makes sense to be researching this in Dundee, one of the great homes of British comics publishing, and to be taking this research into the classroom. DTT: Chris, thank-you for your time. • There are more details of the Studies In Comics journal at the Intellect Books website including a free PDF download of the first issue. • There are more details of Champions of the Oppressed on the Hampton Press website and the book is available to buy in hardback or softcover on Amazon. 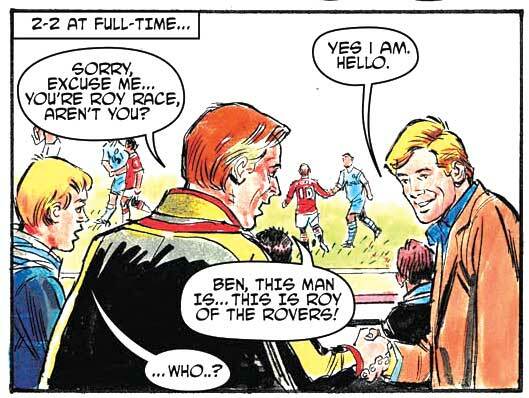 The Daily Mail has published a special Roy of the Rover strip to mark this weekend's biggest match of the season, the 161st Manchester Derby. 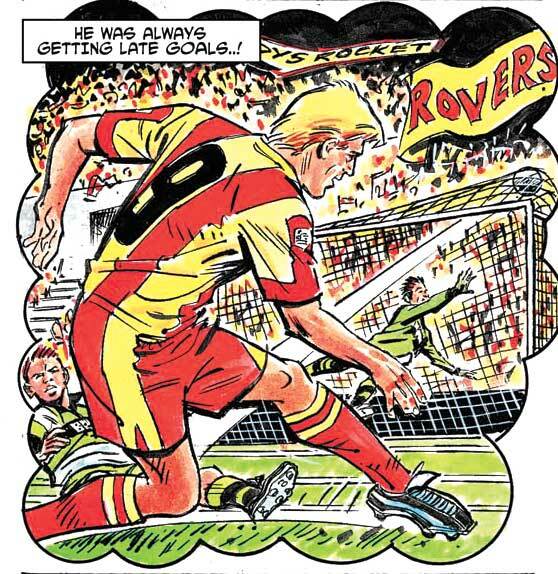 Written by Ian Rimmer, the strip is drawn by longtime Roy of the Rovers artist Barrie Mitchell. "It's a one-off at the moment," Ian tells us, "but who knows..?" I'm sure there are plenty of ROTR fans out there hoping there will be more. Charley's War: Hitler's Youth, the eighth volume of the classic World War One comic strip by Pat Mills and Joe Colquhoun, first published in Battle Picture Weekly, is now on sale from Titan Books, although the official publication date is 28th October. In this explosive new volume of never-before-collected comic strip, Charley comes face to face with a young corporal who will eventually change the face of the world as leader of the Nazi party: Adolf Hitler. The eighth action-packed volume of Charley's War is rich in the detailed minutiae of the terror-punctuated existence of a Tommy and is the first to benefit from the use of original artwork from the story, kindly loaned by the Colquhoun family. Speaking as the editor of the collection, Moose Harris, who did all the scans, has done a knock out job on the strip pages. Also included in the book is a feature by Steve White about Hitler's role in the First World War - and a commentary on the strip featured in the volume Charley's War co-creator and script writer Pat Mills. 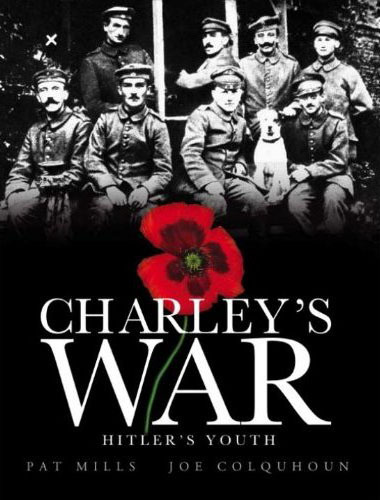 • Charley's War: Hitler's Youth is available from 28th October 2011 all good bookshops. Commado crew at the exhibition's opening night. 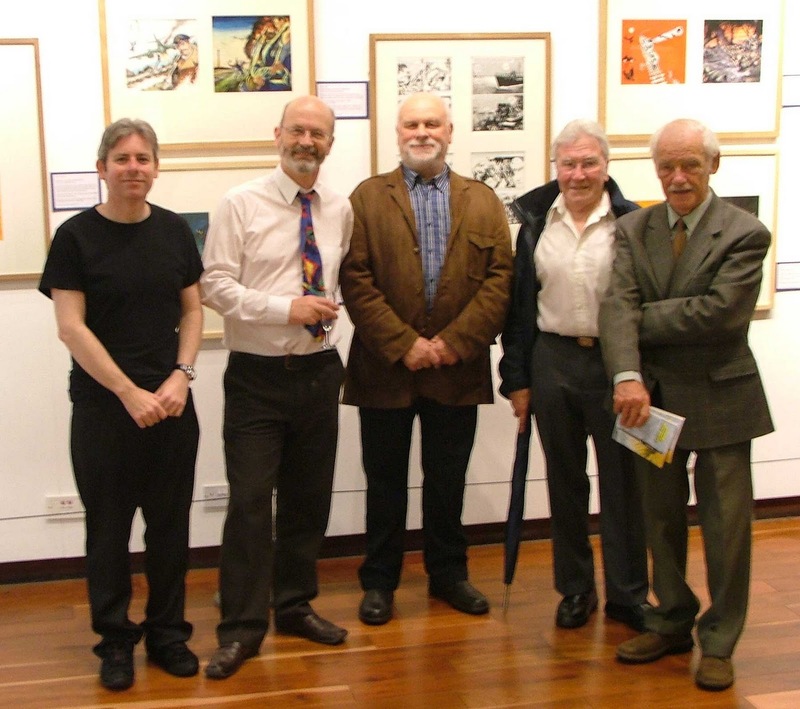 From left to right: Scott Montgomery (deputy editor), Calum Laird (editor), George Low (former editor), Ian Kennedy (artist) and Gordon Livingstone (artist). A quick reminder about the Commando exhibition in Dundee Jeremy Briggs gave an advance plug for last month, which has now opened, in advance of Dundee Comics Day on 30th October. Marking the 50th anniversary of Commando, It's in the Tower Foyer Gallery at the University of Dundee and runs until 19th November. It includes some stunning original artwork by the likes of Ian Kennedy, Gordon Livingstone, Cam Kennedy, John Ridgway, Carlos Pino, Keith Page, Jose Maria Jorge and others, and also features all sorts of interesting memorabilia kindly loaned to the University by publishers DC Thomson. • The exhibition is open Monday - Friday 09.30-20.30 and Saturday 09.30-16.30. Admission is free. Books 2&3 - Captain Steve Rowland? Books 6&7 - Writer John Fleming? With the ending of the eighth book, Thirteen To One, which seems to have settled the idea that XIII is US agent Jason McLane and who number 1 was, For Maria the ninth book in writer Jean Van Hamme and artist William Vance's spy series takes the plot off in a whole new direction. After saving her life in the previous book, XIII's relationship with Jones is now closer than ever as they relax in the luxury of Marquis Armand Preseau and former SPADS Sergeant Betty Barnowsky's home in sunny San Miguel. However XIII receives a phone call from a mysterious, and not entirely wholesome, priest who, when they eventually meet, claims that XIII is married to Maria Santos but, since nothing is ever uncomplicated in XIII's life, she is the leader of the revolutionaries in neighbouring Costa Verde and is currently in prison awaiting execution. While XIII does not remember Maria, he believes that she may be a link to his forgotten past. 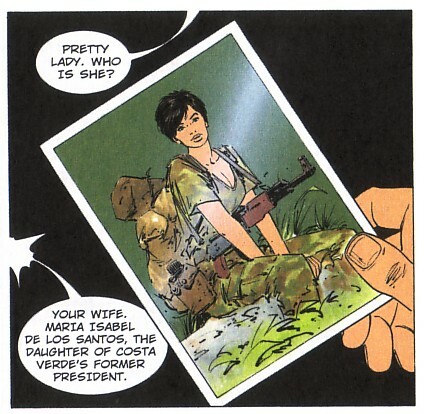 Therefore disguised as Karl Meredith, an arms dealer, XIII travels to Costa Verde to make contact with the rebels and to try to free Maria. However he doesn't bargain on running into Felicidad Moreno, the mistress of Costa Verde's General-President, who XIII already knows as the scheming Felicity Rowland and who recognises him through his disguise. This is definitely one for the fans with returning characters Felicity Rowland from book 2, Sgt Betty (she of the flimsy underwear) from book 4 and the Marquis who took such a shine to Betty in book 5. Van Hamme sets the tone of the ongoing story as he bookends this episode with a mysterious cabal discussing XIII and how they could use him. However before that can happen there is the small matter of a central American revolution, an unknown wife facing a death sentence and XIII going undercover as an international arms dealer. There are times that Van Hamme doesn't do things by halves and this is certainly one of them. It also gives Vance a chance to get down and dirty with his artwork of the back alleys and dodgy dealings of the rebels while spotlighting the wealth and glamour of both the Marquis' home and the presidential palace. Indeed the only misstep of the entire book seems to be on the cover which, strangely, depicts an event that isn't actually in the story. Perhaps the next book will explain it. 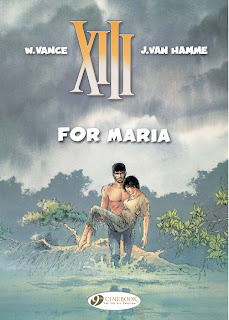 XIII - For Maria takes the tale of the amnesiac agent off in an interesting new direction while also leaving it on a cliffhanger which hopefully will be resolved with the tenth book, El Cascador, when it is published in November. 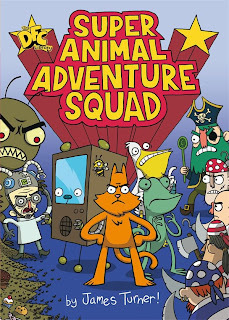 The most junior of the third batch of DFC Library titles is Super Animal Adventure Squad written and illustrated by James Turner. Agent K (a cat), Agent Irwin (a pelican), Agent Rex (an iguana), Agent Beesley (a rather posh bee) and Agent Bearbot (a robot television, seriously) make up the Super Animal Adventure Squad controlled from a far by their boss, a unicorn with an eye-patch. The book covers two of their assignments to help save the world, The Teatime Of Doom and The Case Of The Baboon Bandit. In the first story Doctor Nefarious, "the world's maddest mad scientist," is stealing all the cakes and pastries from bakeries across the country using mind-controlled ants which of course means that everyone will have to go without a mid-afternoon treat. The Squad raid his headquarters and end up fighting against a gigantic ant. Turner's naive style of art initially takes a little getting used to but his writing, with its interesting characters, jokes and above all its puns, will soon win you round to the Squad's side. The first tale was single pages when originally published in the weekly DFC and it sets the scene, but it is the second story, which was two pages per week, that allows the plot to thicken as the characters get themselves into a stew. A set of agent profiles at the end of the book, along with a tongue-in-cheek page on how to draw Agent Beesley, round off a rather nice little package for kids. There is an animated series on heavy rotation on the Disney TV channels at the moment called Phineas and Ferb in which the humans are all drawn as grotesques and there is a secret agent in the form of a platypus. Kids love it and this reminds me of it. 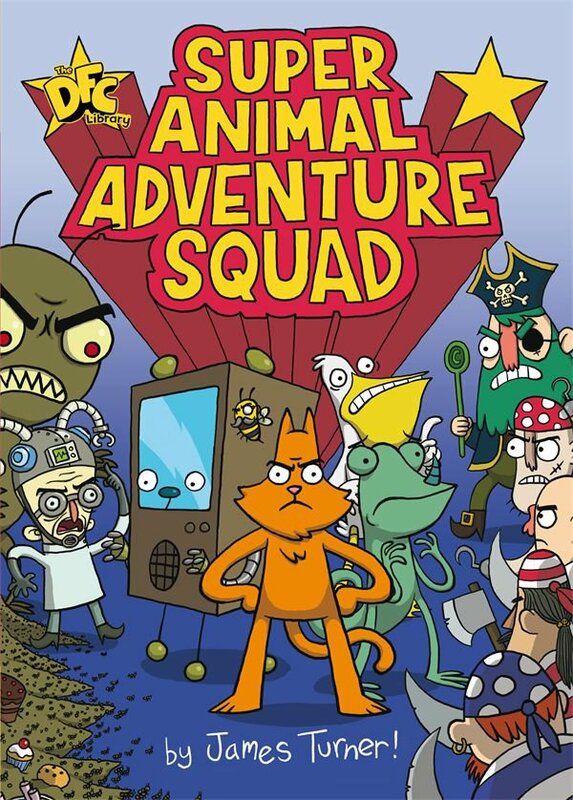 So this Christmas if you have to buy presents for kids who enjoy Phineas and Ferb then you could do a lot worse than giving them a copy of Super Animal Adventure Squad. • There are more details of the Super Animal Adventure Squad on their Facebook page and on the David Fickling Books website. • There are more details of James Turner's work on his blog. Courier problems have hit STRIP Magazine again, meaning the planned launch date had to be pushed back. STRIP Magazine is printed in Bosnia and shipped from there. After problems with Strip Zero earlier in the year it was shipped earlier than required - but still not long enough, it appears, for the couriers to make a hash of things. In a statement, Print Media Productions say they will advise of a new on sale as soon as possible. "Please be assured we're working closely with Diamond to get our first issue into UK comic shops as soon as we can. "Naturally, we are extremely disappointed and annoyed by this turn of events and we know that this news will disappoint many people waiting for the Magazine's debut." The Gondwana Shrine is the fourth of the new adventures of Blake And Mortimer by writer Yves Sente and artist André Juillard, originally published in French in 2008 and based on the original characters created by E.P. Jacobs. Following on from his ordeal in The Sarcophagi of the Sixth Continent, Professor Mortimer is suffering headaches and memory lapses and has been told by his doctor to take a rest from his work. Meeting Nastasia Wardynska, she tells him that analysis of an artifact that he brought back from Antarctica suggests that is from a civilisation that predates the earliest so far known. 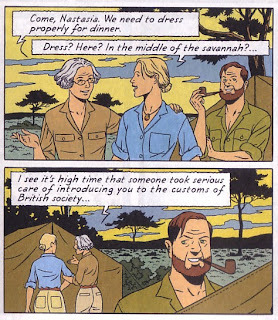 Discovering that a similar artifact has been discovered in Tanganyika in east Africa, Mortimer persuades an old girlfriend, Sarah Summertown, who is a novelist and amateur archaeologist, to go with him and Nastasia to Africa to investigate the area around where the second artifact was discovered. Meanwhile in London, Captain Blake is confronted by a mysterious stranger who convinces him that Mortimer will need a lot of assistance in Africa. 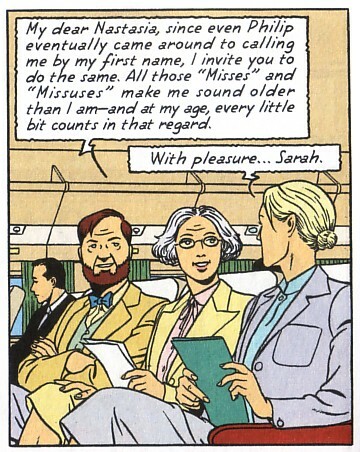 Writer Yves Sente continues his Blake and Mortimer sequence with a story that begins in a fairly standard way and then, building on the plot of The Sarcophagi of the Sixth Continent, heads off on a totally unexpected direction. Gondwana was the name of the ancient southern supercontinent and the tale does indeed take in truly ancient events albeit at times getting more far fetched than even the more science fictional Blake and Mortimer books normally do. That said the strength of the book is in its characters and with Nastasia from The Voronov Plot and yet another former girlfriend of Mortimer in Sarah, Sente has included characters that the reader grows concerned for as the story progresses. 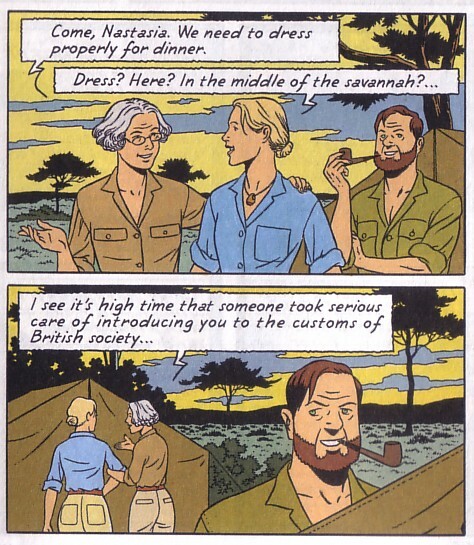 André Juillard's artwork is impressive with accurate depictions of both the wildlife of Africa and the technology of the late 1950s/early 1960s period that these new Blake and Mortimer stories are set in - although quite why his accurately drawn French Air Force Noratlas propeller driven transport aircraft is called a Jumbo Jet in the text is beyond me. The first of Sente's four B&M books was the rather wordy and somewhat dull The Voronov Plot but he found his feet with the two part Sarcophagi tale. The Gondwana Shrine does not require the reader to have read both Sarcophagi books first but, as it is a sequel to them, it would definitely help. 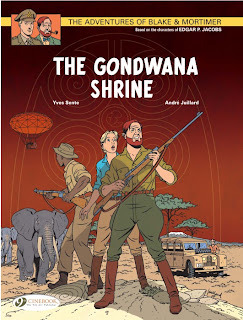 The Gondwana Shrine is a Blake and Mortimer book that takes both the characters and the reader to an unexpected place and those who enjoyed the previous Sente and Juillard books will not be disappointed. There are more details of the English language Blake and Mortimer books on the Cinebook website. There are more details on the series in general on the official Blake and Mortimer website (in French). (With thanks to The Grinning Man, Maidstone): The line up for Demoncon2, taking place in Maidstone in November, is now pretty much finalised and includes comic creators such as Garen Ewing and Dan Boultwood on the guest list, along with many of them creators of web comics you might be following. "Space is going to be a real issue even with the gaming presence from last time gone, but we’ll juggle something," say the organisers. My apologies for the lack of posts over the past week (and special thanks to Jeremy Briggs for stepping up to the plate). Unfortunately, my computer had a hard drive failure (now fixed thanks to Ubertechs in Lancaster) which meant working across a range of different devices instead of my normal one. As a result of this, I've also unfortunately lost a great deal of past email, so if you have sent information about new projects recently, please send them again to the usual address. Thanks! The DFC Library returns with the first of its third tranche of titles, and the first one that wasn't in the weekly DFC - Baggage by writer Robin Etherington and artist Lorenzo Etherington. Randall is the lackadaisical, and somewhat disaster-prone, lost property officer for the tram service of Triptych City. After his latest disaster with a rhino, his boss, the perennially grumpy Bronco Lutz, offers him a last chance to keep his job by finding the owner of the oldest piece of lost property in the company's enormous warehouse. Just about surviving the collapse of the enormous pile of lost luggage, Randall takes the small, old and apparently very well travelled suitcase on a quest around the city in his desperate attempts to find its owner. Using the clues on the suitcase in the form of travel stickers, Randal search becomes more and more frantic as it goes along. Along the way he picks up his good hearted friend Taw, the sensible Mica and the nerdy collector Kong as his quest staggers from one calamity to another and the companions end up being chased by an ever growing mob of disgruntled people. Will they find the owner of the suitcase before the day ends or will the mob get to them first? 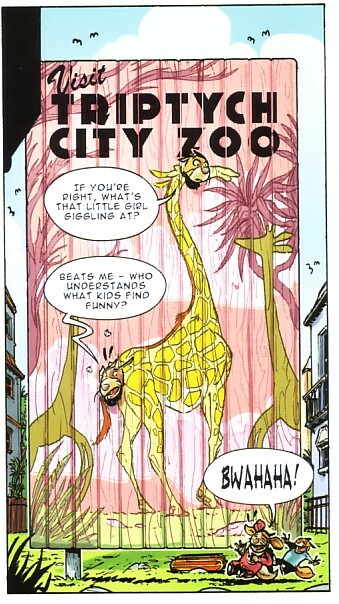 One word best fits the Etherington Brothers work, be it the writing or the art, and that is 'manic'. Robin's writing is so off the wall that the plot is never going to be predictable or even, for that matter, straightforward. 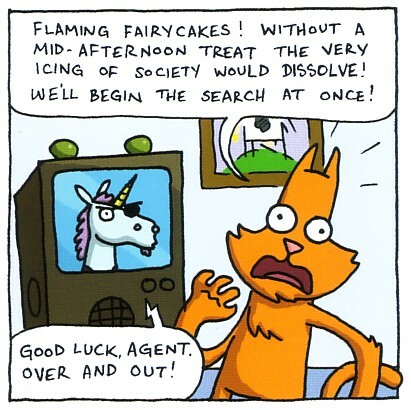 But that is to the book's benefit as what could have been a simple quest storyline swerves constantly between increasingly bizarre situations. 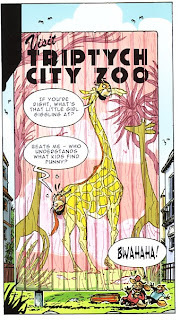 Lorenzo's artwork is beautiful, dynamic when it needs to be and intensely detailed in the quieter sections as the mainly feline characters work their way around the city. 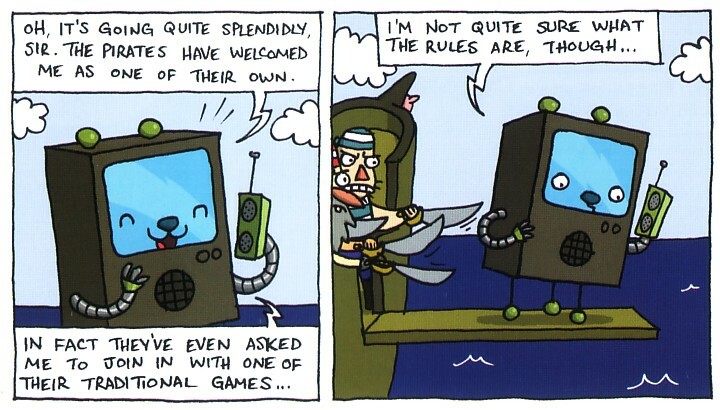 The Etherington's previous DFC Library title, Monkey Nuts, worked well in the weekly comic but suffered somewhat as a book due to the constant action required of a short weekly humour strip which made it something of an exhausting read. Baggage gets over this problem as the action is not as intensely constant, although Monkey Nuts fans will enjoy spotting the in-jokes in Baggage that hark back to the previous title. Baggage is a visual delight that works just as well for adults as it does for children. With Christmas coming up this is one book that could just as easily be on your own 'wants' list as well as being on the list of presents to be given out to others. • There are more details of Baggage on the David Fickling Books website and the Etherington Brothers blog. 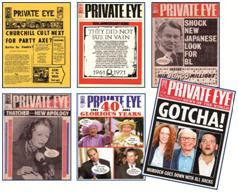 Issue 1300 of Private Eye, on sale 26th October, will be a special issue marking its 50th birthday. 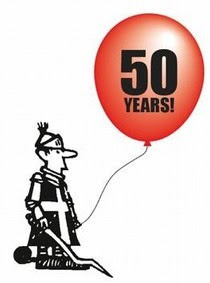 This landmark event for the magazine - which has always featured cartoons and comic strips satirising British life and politics - is also being marked by Private Eye: The First 50 Years. an exhibition of art at the V&A Museum in London, which runs until 8th January 2012. Founded in 1961, Private Eye has survived and prospered for half a century by entertaining, informing and irritating its readers with a unique mix of jokes, journalism, campaigning and gossip. In August, MediaWeek noted that the magazine had retained its position as the UK's leading domestic current affairs magazine with an average circulation of 206, 266 per issue in the first half of 2011. Despite representing a marginal drop of 0.1% on the previous six months, and down 0.7% year on year, the current affairs magazine remains more than 20,000 copies larger per issue than its nearest rival, The Week. The bumper edition of the magazine on sale next week will look back at 50 years of exposing political corruption and scandal. Private Eye: The First 50 Years. the V&A's free exhibition, explores the wealth of artistic talent that the magazine has fostered by showing the original artwork for some of the finest and funniest Private Eye cartoons. 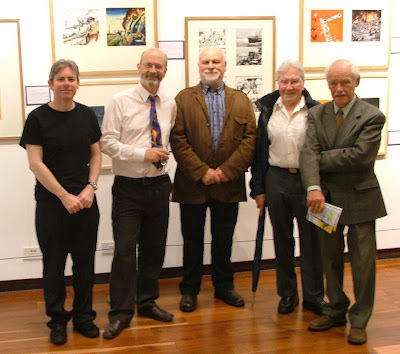 Over its 50 year history, It's published and promoted the work of more than 90 artists, many of whom started their careers at the magazine, including Ken Pyne (above) Gerald Scarfe, Ralph Steadman, William Rushton, Barry Fantoni, Michael Heath, John Kent and Ed McLachlan. 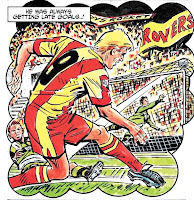 Strips have also included a Dan Dare spoof, 'Dan Dire' in the 1990s, lampooning Labour leader Neil Kinnock, drawn by Nick Newman. The illustrations are being shown in thematic sections on politics, royalty and social observation and are richly varied in style and tone and take the form of single cartoons with captions, long-running strips and caricatures. Ian Hislop, Editor of Private Eye - who is celebrating 25 years as editor - has chosen 50 of the best of the trademark front covers, one from every year the magazine has been published. The front covers are arranged in a timeline, offering a graphic satirical history of the news over five decades. Visually, Private Eye is renowned for its low-fi aesthetic. The cut-and-paste production technique and overall look have changed little in over 50 years, despite the switch from cowgum to computers and letraset to the internet. Private Eye: The First 50 Years aims to evoke the atmosphere of the magazine’s Soho office, with a recreation of the editor’s paper-strewn desk plus seldom-seen ephemera from the magazine’s past campaigns and court cases, plus as a life-sized cut out of Tony Blair, a stuffed dog, a flying Robert Maxwell and a giant inflatable banana. "At last," note Hislop, "Private Eye makes an art of itself." The 50th anniversary is not just being celebrated by the magazine in print. 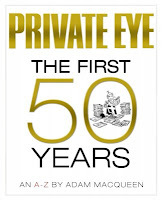 Last month saw the release of Private Eye: The First 50 Years, an A-Z - a lavishly illustrated, definitive history of the magazine, charting its rise from 300 copies of the first edition on 25th October 1961, to a fortnightly readership of 700,000. Written by Private Eye journalist Adam Macqueen, who has been with the magazine since 1997, the book offers is an in-depth, witty and occasionally critical appraisal of the magazine, a long-awaited volume "containing everything you ever wanted to know about the nation’s favourite satirical organ" (it says here). At last the origin of Ugandan discussions will be disclosed, along with the story behind that Andrew Neil photo, and the identity of Britain’s Biggest Pseud. Plus the inside story of the magazine’s many high-profile legal battles, scoops and staff bust-ups, told by those who were there. In addition to a wealth of new material, the book features exclusive interviews with current editor, Ian Hislop, his predecessor Richard Ingrams and co-founder, Christopher Booker, plus a host of other key figures past and present. The book also contains exclusive reminiscences and revelations about former contributors including Peter Cook, Auberon Waugh and Willie Rushton, in addition to rare archive material, unseen photographs and an abundance of cartoons from the likes of Nick Newman, Tony Husband and Michael Heath – many never before published. Also on sale now is the 2011 Private Eye Annual presenting the very best of Private Eye’s unique blend of wit and humour, jam-packed with pages of parody, the funniest spoofs, gags, cartoons, photo bubbles and topical humour. Consistently found in the best seller chart and selling in excess of 78,000 copies last year alone, it's a must for every Christmas stocking. Scotch Corner artist Graeme Neil Reid is running a competition over on his I Got No Work Done Today Because... blog to win one of three new Doctor Who colour sketches that he has been displaying over the last week. So that he can enjoy comic conventions himself rather than spending the duration of them sketching, Graeme creates his A5 colour sketches beforehand, displaying them on both his own blog and on the Scotch Corner daily art blog for people to see. His Doctor Who sketches based on the new series as so popular that they regularly sell out faster than any of his other themed sketches at the conventions that he has attended. 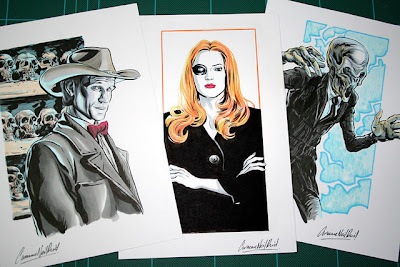 Each of the three sketches are inspired by the final episode of the latest season of Doctor Who, The Wedding of River Song, and depict the Doctor wearing his cowboy hat surrounded by skulls, Amy Pond with her suit and eyepatch, and finally a Silent. The details of how to win your choice of sketch are on the I Got No Work Done Today Because... blog. More of Graeme Neil Reid's sketches are available to buy at his Original Scribbles webstore. 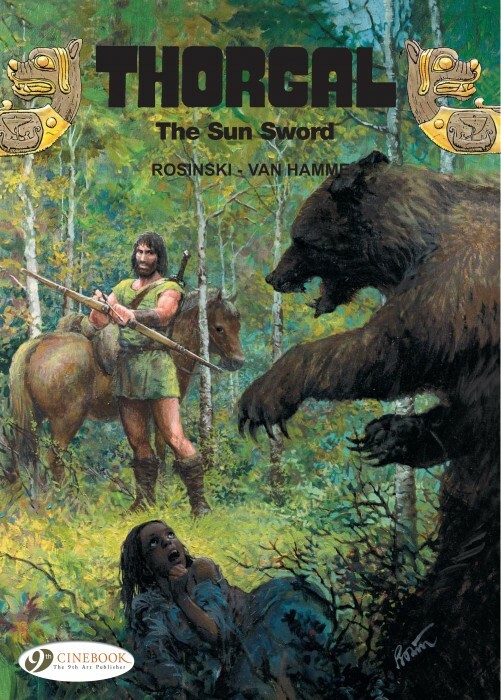 Writer Jean Van Hamme and artist Grzegorz Rosinski return to their sword and sorcery adventurer in the tenth Thorgal book to be published in English by Cinebook, The Sun Sword. Thorgal has had an uneven time in the English language. There were 3 books translated and published by Ink Publishing in America in the late 1980s and early 1990s while the album Au-Delà Des Ombres was translated by Diana Barton and published as Beyond The Shadows over six issues of Marvel UK's bi-weekly Strip comic in the summer of 1990, eighteen years before Cinebook published their version of it. However Cinebook have had the dedication to start his adventures and, having published his out-of-sequence origin story, they have kept them going in their original French publication order. 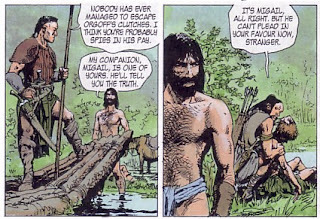 Jean Van Hamme as writer on any of Cinebook's titles is normally a sign of top quality but I personally prefer his contemporaneous series like XIII, Largo Winch and Lady S rather than his more historical series such as Thorgal or his version of Blake And Mortimer. I don't have a thorough grounding in Thorgal's previous adventures and this book, using as it does characters and technology introduced in much earlier stories, comes across as one for the fans because of that. Without that background the book can still be read and understood, but I suspect that it would have been better if I had known already known those characters that Van Hamme reintroduces here. 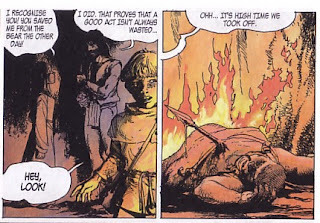 The story is basically a Conan-style tale with a science-fiction twist, the Sun Sword of the title, as Thorgal is enslaved by a tyrant, escapes, is captured by rebels, conveniently knows their leader and then helps to lead the revolt against the self same tyrant. There is a nice B-story of a peasant boy befriending the girl of noble birth that Thorgal saves at the beginning and how the unlikely pair interact on the sidelines with the other characters in the tale including Thorgal. It would have been interesting to see the entire story written from their perspective rather than have them dip in and out of the action but this is Thorgal's book and not theirs. Rosinski's artwork remains as pleasant as ever to look at. I have said in a previous Thorgal review that his style reminds me of John Ridgway's coloured art and this book only serves to emphasise the thought, especially having seen John's coloured art for Strip Magazine's similarly themed tale The Age of Heroes written by James Hudnall. While Thorgal - The Sun Sword may not be the best Thorgal for a new reader to start with, I suspect that it will be something of a treat for those readers who have stuck with the series so far.